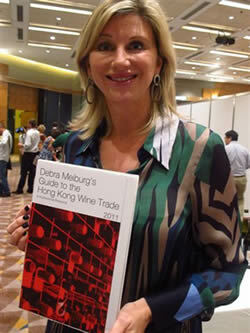 Nov 03: Featuring a comprehensive importer directory and market report, ‘Guide to the Hong Kong Wine Trade’ is the title of the book authored by Debra Meiburg MW which was launched today at the HKTDC’s International Wine and Spirits Fair at the Hong Kong Convention and Exhibition Centre, Booth 3CON-021, with the official launch slated on November 5. The Guide is a first directory of its kind about HK importers and distributors and includes the area of market dynamics, distribution channels as well as market insights , based on 398 survey completed by the wine trade. ‘Since the waiver of wine taxes in 2008 the Hong Kong wine market has been growing exponentially and it’s been hard to keep a track of the new importers and with 40 wine producers a day sending requests for advice, F&B professionals bemoaning the glut of importers and wine lovers still unsure where to find a good Grüner Veltliner, I thought there was a need for a book like this,’ says the author, Debra Meiburg MW, author of the book. ‘The 456-page Guide is based on the response of 386 importers out of a total of 1200 we contacted. It has groundbreaking consumer and industry research, articles on alternative distribution channels and entry points,’ says Debra who adds that with the support of HKTDC and trade commissions of 22 wine-growing countries, this Guide contains everything you need to know about Asia’s wine hub. ‘The evaluations have been done according to our unique rating system and the Guide will be a must-read for wineries interested in the booming Hong Kong market, she feels. Meiburg also presented her inputs and insights on the market based on the research conducted for the Guide today. She also presented the new suite of "edutainment" tools . One can also taste the medal-winning wines from the Cathay Pacific Hong Kong International Wine & Spirit Competition with the same types of dim sums used by the panels of pan-Asian judges to evaluate that pairing category during the judging period. ‘The Directory has been livened up with caricatures of some of the more prominent Hong Kong wine importers as well as some newcomers despite the fact that many people were not thrilled with their caricatures as they did not seem to be familiar with the idea of a caricature . However, when we thought the criticisms were fair we changed the drawings,’ says one of the girls at the booth, who assisted Debra in the project. ‘We did an extensive search of each and every importer website that we had been given or could find on Google and were fairly frustrated by some of the results. They ranged from super-slick and attractive but with challenging interfaces to pdfs with no links at all. Many required at least 5 clicks before you could get to a bottle-shot,’ this representative of Debra Masterofwine, who has published the book. The Guide features 253 Hong Kong wine importer listings and a 34-page market report based on a 40-question survey to help wine producers find an appropriate Hong Kong importer. Each entry shows key facts about the importer’s portfolio, marketing activities and sales team to save boutique wineries from wasting time on bulk importers and vice versa. To help F&B professionals and consumers navigate the myriad options available there are also directories of retailers, logistics companies and more. 23 pages of portfolio highlights identify some of the strongest importers in various national and stylistic categories. Surprises from the market report include the number of importers operating in China (131), given only 9 respondents are registered wine exporters with the Hong Kong Trade and Industry Department. Despite hype about Hong Kong’s luxury market, only 16% of wine importers named luxury (WSP HK$1000+) as their key market segment. 32% focus instead on premium brands (HK$151-$350) and 31% on mid-market (HK$61-150). Chile, often unfairly dismissed in Hong Kong as a source of cheap table wine, is exonerated. Only 33% of value-focused importers named Chile as a top 3 portfolio source whereas 61% named France. The official launch takes place on 5th Nov. at 11am in Hall 3D Wine Gallery and later at the WineFuture being held at the AsiaWorld-Expo on 6-8 Nov. at Table 137). One may also get a taste of the Grape Cues- a book of 100 questions designed for the wine connoisseurs and students alike. Costing HK $200 (US$26), these books cover specific countries like Italy and Germany.